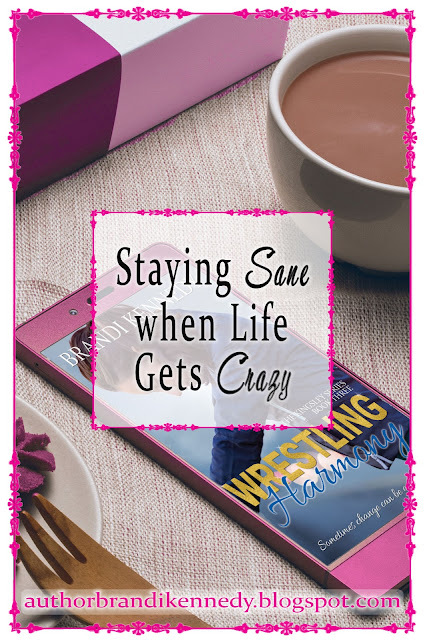 Love Stories and Lifestyle for the Undaunted Woman. My life in the last few months has been even more stressful than usual - which for me, as a disabled single mom with C-PTSD, is saying something. PTSD is like constantly living with a charlie horse in the back of your knee; you have to be very careful in your movements, your stretches, your activity. All to prevent activating that horrible, painful cramp, because once it starts, your in complete misery until it lets up - and there aren't a lot of ways to make it go away. The end of 2018 was a giant, uncontrollable, full-body charlie horse - my PTSD was already something I was struggling with as the seasons changed and holiday stress get heavier, and I was still struggling in many ways with the diagnoses I received earlier in the year as well. Both blessed by the validation and heartbroken by the prognosis, I had a lot to process all at once - and that was all before my Grandma died, sending my mother into an almost constant hospital stint that's actually still ongoing. And that's just the stuff I'm sharing publicly. So yeah, crazy life, huh? Still, other than a lapse in my writing and a decrease in certain other areas I had previously made progress in, I've been doing my best to cope with what's going on with grace and dignity, hoping to show my children by example that no matter how hard things might get in the day-to-day, things always work out in the end if your keep faith and keep trying. Mental health is a major factor in my life, both as a person with the mental impact of chronic physical illness, but also as a single mother, a mother of children with chronic illnesses, a daughter of parents with various mental and physical illnesses, and the adult child of an extremely abusive upbringing. I have to work constantly on my mental health, reminding myself to take charge of my emotions, my perspective, my darknesses. I work hard to balance all of that with my own human-typical needs - the desire to be heard, to be accepted, to be surrounded with like-minded people, to feel successful at something, to be necessary somewhere. Perhaps most importantly, mental health is a huge factor in the lives of my children - though their lives are not quite as traumatic as mine has been (and indeed mine has not been quite as traumatic as my mother's was), I am actively trying to educate my children on the hard lessons I've learned over the years so that they can walk through their lives with the benefits of wisdom I wasn't given. And how do I do that?? Easy. I simply allow them to see me coping. I don't shut my emotions down in front of my kids. I don't "stay strong," and I don't "keep it together." They know that I am active in managing my mental health, that I am active and open-minded in managing my physical health, and that I have struggled over the years to find and implement coping strategies that help me mitigate the impact of my issues on our life as a family. But man, that gets hard to hold onto when life gets out of control. Which is why I thought this would be a good time to break down my top tips for staying sane when life gets crazy. Strive for balance between rest and action. I'm a pushy person in general, and I'm just as pushy with myself as I tend to be with others - in fact, I'm probably more so. I'm also a bit of a perfectionist in some ways, and I tend to drive myself very hard mentally. But it's just as important to take time to rest and heal as it is to keep driving forward, and maintaining the balance between the two concepts has been one of my greatest struggles thus far. That being said, one of the things I hope to get better at this year is maintaining a solid routine throughout my days that will help keep things automatic so that they feel less stressful while including time for both necessary productivity and spirit-healthy rest. Read, study, and pray. I know this isn't as much of a big deal for some as it is for myself, but for me, spending time with God makes a huge difference in my daily life - not because of any miracle or anything like that, but simply because God gives me comfort, and that comfort is much easier to receive when I'm spending time with my Bible In general, I feel more at peace, more open to new ideas, more contented despite my drive to move forward, and more confident in the steps I'm taking as I take them - even when my life feels chaotic and utterly out of control. Utilize the benefits of technology. My phone is one of my most valued connections to the world outside my house; inside that small device, I have the encouragement of friends, the safety of my private journals, the comfort of this blog, the promise of the Bible. I carry entertainment, amusement, and distraction right there in my phone - which also doubles as reminder carrier, calendar keeper, trip navigator, health tracker, medical connector, finance watcher, personal assistant, and so much more. My life would be a very different kind of mess without the blessings of advanced western technology to help me keep everything in check. Ask for - and accept - help. 2018 was hard for me both emotionally and financially; there was a lot of "extra" to juggle in both categories, and while I'd like to say I always did well with it, the truth is I didn't. And yet, I took steps toward what I want in my life, both in writing and in other areas - one of which was the area of being too proud to really ask for, or accept, help from others no matter how desperately I might need it. 2018 was humbling for me in many ways, all of which led back to the need for a sense of community - and the impossibility of having it if you find it only to refuse to see it or take advantage of its presence. Know the difference between "trustworthy" and "curious." In recent years, I've seen a very clear line drawn between two very different areas of my personal inner circle; in sitting down to honestly look at the contrast between people who are genuinely there in support of me and those who are hoping just to know about me or have me feel indebted to them, I'm learning not only how to spot the right people sooner, but how to draw a barrier between myself (my hopes, dreams, wishes, plans, feelings, etc) and people with motives not aligned with my best interests. This has been a particularly difficult lesson to learn, as I often found myself surprised by the true colors of friends and family members I had thought to be one way, only to see them turn out entirely otherwise. And yet, I'm thankful for the life lesson, both because it was good for me to learn and because in knowing it, I can take steps to share with my daughters, giving them tips and tricks as they seek ways to find their own balance between cautious and trusting. And above all, the greatest coping mechanism I have is to keep trying. I get up every day even if I have to lie to myself in order to make it happen (I'll often tell myself that if I get up and get going, get the kids to school, then I am "allowed" to come home and go back to bed, even knowing that once I'm up, it's often too difficult to make going back to sleep worth the effort.). I make coffee or tea, depending on how ready I am to risk crippling pain (caffeinated energy drinks of various types don't seem to bother me at all, but coffee is a major misery trigger), and I make time to journal while I drink it. Then I try to get a new day started, whether that means prepping for appointments, visiting my mother in the hospital, running errands, or trying to sit down and get some writing done. Because no matter how crazy life gets, my children deserve the kind of sanity I didn't have growing up. They deserve stability and dependability, even if it lives in the limited mobility of this body I'm using to travel through my days. They deserve to know I'm there, and I'm trying, and that I love them enough to keep doing that every day. I guess all that to say this: my kids keep me motivated to stay sane, to learn to cope, to keep on keeping on - and to share what I've learned here, where others who might need these lessons can find them. If you liked this post, drop a comment below to tell me what you'd like to see in future posts - and I'd also love to read comments about your vision for 2019 if you have one! I'd love your feedback and the chance to interact with you, and I'd be honored if you could take a second to share the link to this post with your friends - shares help me connect with new readers, which is always a win-win. I would also like to invite you to become a member of the Undaunted Army! In joining, you'll agree to receive a free monthly email that'll keep you up to date on all the latest in nurturing your mental health, well-being, and self-empowerment. I know how hard it can be to keep going - but there is strength in numbers, and as a member of the Undaunted Army, you have the assurance of knowing you will never fight your battles alone again because I'll only be one quick email away! Let's keep in touch. You can also help me continue to make a difference in coaching others to connect with their own Undaunted spirits through empowering women's romantic fiction. Invest in the bigger goal of the Undaunted Army for just $1 a month, and you'll have early access to all my new fiction and poetry writings! Or, you can wear your Undaunted Pride right out in the open by sporting Undaunted Army merch - keep checking back for new designs, too! However we stay connected, always know that my brand and the Undaunted Army are built on what I write and who I'm writing it for. "Love Stories and Lifestyle for the Undaunted Woman" isn't just a slogan or a tagline - it's a purpose and a goal, which is why whether you're a first time reader or a long-time loyal follower ... from the bottom of my heart, I thank you for being here. Enlist In The Undaunted Army! Members of the Army are usually supporters of personal growth and empowerment who care about mental health and wellbeing, living a fulfilling lifestyle, and soaking up the entertaining magic of a good book. They are kind and considerate, driven to succeed, interested in making friends and being part of a community, and willing to share their gifts with those in need. Our mission is to create positive change in the world through the strength of our resilience, the courage of our ranks, the compassion of our hearts, and the sheer force of our awesomeness. If this sounds like you, click HERE. This site includes affiliate links to various products and programs. Through clicks and purchases resulting from these links, I may receive a small commission - at NO additional cost to you - but you should always know I will only work with companies I believe will honestly benefit you as a consumer, I will never give less than a totally honest review or opinion of any product mentioned here, and I will only ever work with brands and companies that I truly love.